More than 50 million Americans suffer from allergies each year. A person experiences an allergic reaction when the body’s immune system determines a foreign substance to be harmful and attempts to destroy it. Allergies can be a mild nuisance or they can be severe, affecting quality of life or even being life-threatening. This is why it’s important to identify the cause for any allergies you may be experiencing. In more severe cases of allergies, one may experience a life-threatening reaction called anaphylaxis, which causes trouble breathing and swelling in the mouth and throat. The best way to identify what allergens may be causing your case of allergies, it is best to talk with an ENT medical professional about allergy testing that can be performed. Our doctors at Totum ENT can perform testing to identify the allergy and plan a course of treatment. 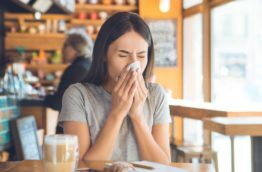 Most cases of allergies are resolved by simply avoiding the allergens as much as possible or through medications like antihistamines or nasal sprays. In some cases, immunotherapy, otherwise known as allergy shots, can be prescribed to resolve the allergy.